An interview at Bookninja. Thanks to Marianne who has just recently published Swim, a novel. Several smashing critical essays on blert by Influency members, here. Make sure to read “Self-appointment with wind” by Margaret Christakos. Thanks to all of you who made Toronto so warm during my latest visit. Influency was a ridiculously amazing and generative experience. Thank you again to all the participants and to Margaret for her tireless engagement with words. I hope to find a place to post some of the papers written on blert – stay tuned. Also in Toronto I was fortunate to participate in Aural Transl (oc) ations made possible by the indomitable Jenny Sampirisi. Please follow the link to read a great article written by Marianne Apostolides on the collaboration which prompted this panel discussion. Video of the Vertigo Voices reading in Veron BC – simply a wicked night of generosity, beer and timbits. I really hope you read this and this. Thank you for all the kind comments about my readings at the Vancouver International Writers Festival. Check out Nikki’s blog for some commentary about one of the events. Last summer the Scream Literary Festival commissioned a collaboration between three wildly different poets: Souvankham Thammavongsa (Found, Pedlar Press 2007), Jordan Scott (Blert, Coach House, 2008), Bill Kennedy (Apostrophe, ECW, 2006) and composer Paul Swoger-Ruston. The result was a magical afternoon of sound and creative energy. Ryerson University’s English Department is continuing the discussion around artistic collaboration, hosting Jordan Scott, Souvankham Thammavongsa and Paul Swoger-Ruston as they present their individual and collaborative works. Readings will be followed by a panel discussion, moderated by local writer and critic, Marianne Apostolides. Refreshments served. Free Admission. Doors open at 7:30. Readings commence at 8pm. Look under Writers’ Rooms for my space at Pitt Lake. blert on ditch, poetry that matters. Oregon and Seattle with Donato Mancini and Steve Collis. Stone walls, gardens, speech pathologies, first nations languages, geography, architecture, urban planning, cities, sculpture, walking, animal tracks and paths, sound poetry, poetry, poetics, drawing, maps, utopia, Richard Long’s lines made by walking, Alexander MacKenzie, academia and poet’s careers, knowledge, poets, travel, the material, etc. Thanks to the fine fine folks at the Spare Room Reading Series. A recording of the Robson Reading Series here. Thanks to Zach Wells for the recording. Mostly fine whiskey and CBC interviews – not at the same time. Glimpses of the sea and cloud watching. In Edmonton I visited ISTAR. I learned a great deal from the hard working people at the center and hope to return soon for a presentation and reading. Calgary: Home. Full with boisterous poetics, bump and grind friends, and blunderbuss exhaust. The reading at Pages Books in Kensington was close to the happiest moment I have had so far. 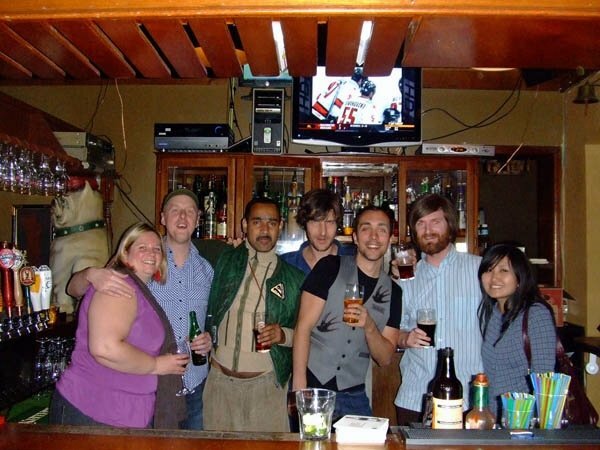 Afterwards the staff at the Kensington pub let us take a picture BEHIND the bar! 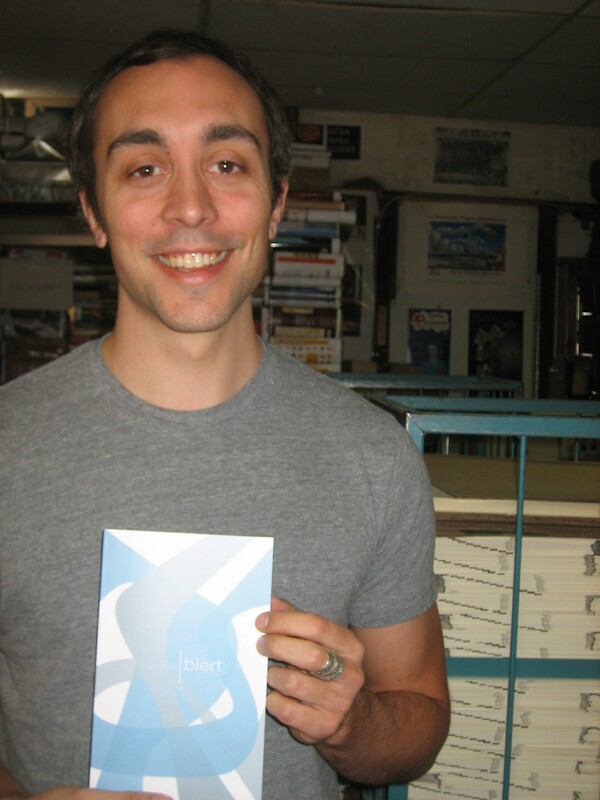 This past Wednesday I caught the first copy of blert fresh off the glue machine at Coach House Books. The staff at CHB always astound me with their craftsmanship, humor and passion – as they let me linger downstairs for an hour or so, watching them cut, glue and laminate, while I carefully flipped through my first copy. Launch next week! Tour starting on April 12th! Also, in the Acknowledgments I forgot to mention two very important small press publications: rob mclennan’s wonderful Poetry Broadside series that published “What is the Utterance” and derek beaulieu’s No Press (I mentioned housepress by mistake) which published a beautiful selection from blert. My thanks and apologies to both rob and derek who spent so much time and effort crafting these gifts. I owe them both many beers. A couple of months ago I worked with Artist Bloc and Tim Posgate to create a short film about stuttering. An excerpt documenting the making of the film can be found here (Yes, I am wearing a scarf with a tee-shirt, I know…) The basic premise of the project is to read blert into an oscilloscope machine which will measure the stuttered patterns of my speech. Those speech patterns will then (simultaneously) be ‘translated’ by a group of musicians (banjo, sax, vocal, drums, bass, violin, guitar) – stretching the stutter into an orchestra of rare permutations. The wonderful news is that Artist Bloc (Director Aaron Kopff) has received a Bravo Fact grant to develop the initial idea into a short film to appear on Bravo later this year. Congrats all around! I heard you speak at the Vancouver Writers Festival this past weekend, and just wanted to let you know how much I enjoyed your poems and reading.